The southern stretch of the Los Angeles River looking north from Downtown Long Beach. Photo by Brian Addison. Following the release of its draft plan late last year along with renderings earlier this year depicting the possible changes the Los Angeles River could face in the coming years, the County of Los Angeles is seeking comments and suggestions from locals as it hosts a community meeting in Long Beach to discuss the river’s master plan. Set to take place at the Jenny Oropeza Community Center at Cesar Chavez Park on Wednesday, Oct. 24 from 6 to 8 p.m., officials from the county will be formally discussing the Los Angeles River Master Plan, the guiding document for the 50-plus miles of river that stretches across our county. 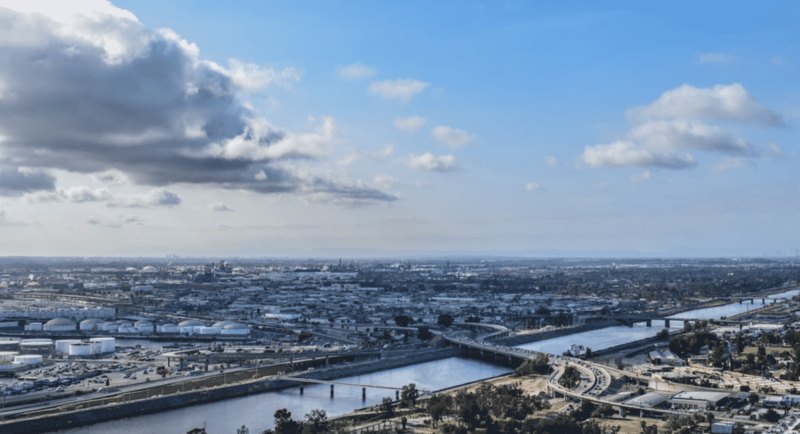 Officials say attendees will “have plenty of one-on-one time for you to ask questions to members of the Los Angeles River Master Plan team” and encourage visitors to come equipped with ideas for the lower portion of the river. This work is in conjunction with the work of the Los Angeles River Revitalization Corp.—a group that focused on the stretch of the river in the City of Los Angeles proper and whose study was adopted by that council in 2016—and the work of the Lower L.A. River Working Group. The latter was formally formed by the state in 2015 to study the stretch of the river that spans roughly from Vernon in the north to Long Beach in the south. Unlike its more northern stretch, where the river winds through less dense spaces like Calabasas and features vast amounts of park space at or around the river, the lower stretch of the river is often next door to a dense are of homes and residences, complete with concrete flood controls that bank each side—and with that, presents the most potential for turning the space into much-needed recreational and green space. When it comes to the 1.2-mile Long Beach stretch of the river south of Willow Street, finishing touches from the meetings of the working group hope to bring boardwalks that will crisscross along the extension of the river, including under a proposed bridge park at Hill Street that will be elevated above the river so visitors can have high-reaching views of the river’s entire southern extension. While some money has already been secured in helping the working group’s vision comes to life, it hinges on cooperation with the Master Plan development, at least from a state perspective, according to Alf Brandt of State Assembly Speaker Anthony Rendon’s Office. In other words, the work of localized groups has to come together in more a structured, cohesive way—and the Master Plan is the route to achieving that. The next community meeting for the Los Angeles River Master Plan will be held at Jenny Oropeza Community Center at Cesar Chavez Park, located at 401 Golden Ave., on Wednesday, Oct. 24 from 6 to 8 p.m.